I’m curious about how to take more effective notes, so I’ve been researching different systems. 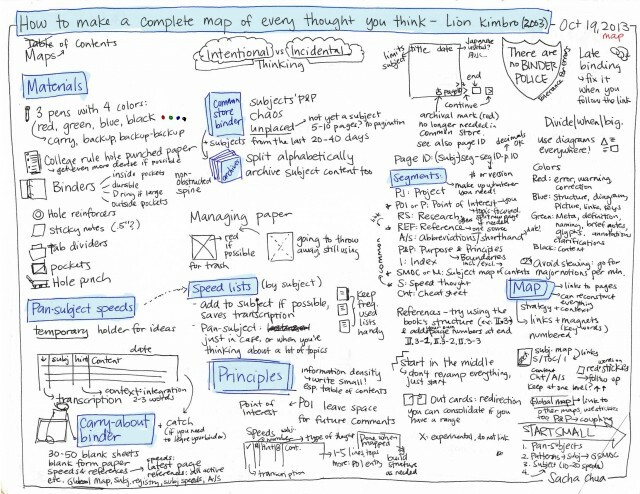 I came across Lion Kimbro’s experiment with mapping out his thoughts years ago. I finally sat down and condensed the free 131-page e-book on How to Make a Complete map of Every Thought You Think (2003) into this one-page summary. You can click on it for a larger version and print it out if you want. The book describes a system for taking quick notes and integrating them into subject-based sections in a larger binder, with some notes on managing your archive. It also gives tips on splitting large subjects and mapping out the connections between topics. I’ve been using some of the book’s ideas on colour and icons, indicating TODOs with green boxes and structure with blue ink. Maps are handy too, although I tend to use computers so that I can link and rearrange easily. Both visual thinking and technology have come a long way since 2003, when Lion Kimbro wrote this book. With Evernote and the Fujitsu ScanSnap, I can scan my sketches and file them along with my blog posts and other notes. I back up my data so that I’m less worried about losing my archive, and I also keep my paper notes by date. I’ve started using Freeplane to build my global subject map, which I’ll cover in a future blog post. There are still some tech gaps, but things are pretty cool. Want to learn more? See my sketches about learning or note-taking, or my blog posts about learning. Tell me what you think or what you’re curious about! 2006: Emacs presentation was a blast! 2006: Excited about my DemoCamp presentation! 2003: /dev/ide/host0/bus0/target0/lun0/disc does not have any corresponding BIOS drive. 2003: Bah. mozilla-psm is segfaulting on me today.